Kwanzaa is a holiday celebrated by Pan-Africans across the Diaspora and in growning nations on the African continent. On each of the 7 days that the holiday is celebrated, a principle is observed that is designed to shape the character of the participants and the community as a whole. These principles are collectively called the Nguzo Saba. If we’re to progress as a race, the Kwanzaa principle of Umoja (Unity) will be the glue that will cement us. After integration, Black people have chosen individualism as their standard for progressing in a Euro-centric society. When we look at the statistics, Black people have not progressed at all economically. We own very few businesses & have very little to no transferrable wealth to leave the next generation. There is a solution available via the unification of the race. Through 400 years of chattel slavery, many of us were forced to abandon our original names & were given the names of our slave masters. Presently, we do have the option of dropping all Euro-centric names & taking on more ethnic names that will allow us to define ourselves in our work. This would give us an identity that will display pride (the Kwanzaa principle of kujichagulia). Instead of allowing our oppressors to create jobs for us and speak for us, we will direct our energy towards building venues for our creative works. Our music, entertainment & politics needs to be controlled by us. Since a new year will be starting in a couple of days, I’d like to challenge us to work together collectively. I’m calling bloggers, vloggers, entrepreneurs & others to team up & take the initiative for collective work & responsibility (the Kwanzaa principle of Ujima). This could be coming together for a particular project, initiative or some sort of research that would be of benefit to the community at large. We could fund a food drive, clothing drive, or even help clean-up our streets & improve our neighborhoods. We could hit the streets to mentor our younger brothers & sisters. Through the use of cooperative economics (my favorite principle) or Ujamaa, we can aggregate Black wealth to actually build functional communities. According to the 2016 Neilsen report, Black people have an estimate of 1.1-1.5 trillion dollars in purchasing or consuming power. We’re legitimately the 15th largest economy in the world. Think about this deeply for a second. We could literally start our own country if we wanted to with all of the spending power we have. We must first invest & develop our own infrastructures. This may be a tall order to fill for now. In the meantime, I’d like to suggest that we support Black owned businesses consistently throughout the entire year & not just for “boycotting” purposes when our brother or sister is gunned down. Every move from now on should be done with greater purpose & understanding (Nia). The lack of not deciding on a strategy to uplift our community has been to our detriment. With all of the education & trades that we hold, we could use these skills in building up our community. All we need is to be focused & committed in doing so. In conclusion, we can’t forget the last two Kwanzaa principles of kuumba (creativity) and imani (faith). Since we’re coming up on a New Year, I know many of us have plans & resolutions. Make a promise to yourself that whatever your gift may be, you consider using it to heal yourself & our community. The creative arts can be used in aiding the healing process . It’s not limited to acting or writing songs. In fact, you could even use scrapbooking, journaling or blogging to get your creative ideas out there. If we’re going to thrive as a community, I’d suggest a dose of faith. If we reflect on how our ancestors fought for us to get here today, we know they had to possess tremendous amounts of faith. This is fundamental if we’re going to continue to progress & uplift of our people. Many Blacks in the Diaspora see Kwanzaa as an alternative to Christmas. In reality, Kwanzaa is not an alternative to Christmas for Pan-Africans. Those who truly separate from alien cultures no longer acknowledge or practice alien holidays that reinforce alien beliefs. Let me give you an example: In Bhutan, a holiday called Shabdrung Kurchoe is celebrated in April as a national day of mourning. In India, the Hindu festival of Maha Shivaratri is celebrated in honor of the god Shiva. The reason you may not have heard of or don’t care about those holidays is because they have nothing to do with you or your culture. The same should be said of Christmas for Pan-Africans. By continuing to practice western holidays that reinforce white supremacist values systems, you are willingly participating in your own miseducation. The very definition of miseducation is a process by which ones culture comes to resemble that of an alien group’s. Therefore, as you begin to re-awaken and re-educate yourself the values of the white supremacist West will no longer be right and exact to you. An mkeka is a straw mat that will serve as the foundation of your Kwanzaa altar. BRAND NEW 3'x5' (90cm x 150cm) 100% POLYESTER INDOOR/OUTDOOR FLAG. The red, black, and green flag is the banner of Pan-Africanism. It expresses our belief in the laws and individuals who represent Africans in the Diaspora. It reaffirms our commitment to the establishment of a Pan-African state, and a future homeland where we can continue to build the future of Black History. A kinara – also called a kwanzaa menorah – is a candle holder designed to hold 7 Kwanzaa candles. 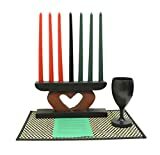 BuyAfrica (Kwanzaa 365) 10" Candles 6-8 hour burning time, solid colored wax, NOT white candles dipped in colored wax. BuyAfrica (Kwanzaa 365)Dripless candles if burned in a draft free location. Corn or Muhindi represents children. Whether you have children or not, every family places an ear of corn on the mat in recognition of the fact that we all are collectively responsible for the care, welfare, and development of children. These ears of corn are placed on either side of the mkeka. The name Kwanzaa is derived from the Swahili phrase “matunda ya kwanza” or “first fruits” in Swahili. In many indigenous societies, communities came together at the end of the year to work (Ujima) and harvest crops. One person alone could not hope to harvest all the crops, but because the community was able to unite and work together, everyone ate. Tambiko (eath and water) and mazao (crops) are placed on the table to remind us that the effort that we apply to our community in the form of our labor and service will determine quality and quantity of our outcomes. Gifts are given to members of the family on the final day of Kwanzaa on December 31. During Kwanzaa, families drink from the unity cup to reinforce their commitment to the bonds that hold them together. 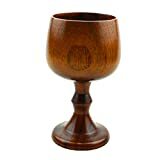 Hand-made Solid Wood Goblet, Made of Jujube Wood. Keep your drinks in a natural style. The African proverb, “the ruin of a nation begins in the homes of its people,” can not be repeated enough. For with the unity of our families will come the unity of our nation. Get this full setup by clicking the image above! You can buy everything you need to assemble your altar from The African Heritage Collection by clicking the image above or by clicking this link. You will only need to buy a red, black and green flag here, the gifts, and the crops. The set shown above comes from a Black owned company and includes instructions on how to set up and observe each day of Kwanzaa leading up to the Karamu – the December 31st Feast. Set includes Kinara, cup, Set of 7 candles , mat and information sheet. Candles are 12"H. Set beautifully shrink-wrapped for your convenience. You can also add a copy of KWANZAA: How to Celebrate It In Your Home to your library. Our ancestors had their culture beaten and raped out of them, and those who tried to hold on to the old ways were murdered. Out of fear, they raised their children to accept and practice western ways to stay alive. Those children became your great-grandparents and ultimately your parents. If we are to give birth to a new Golden Age of Pan-Africanism, we must reverse the damage done by centuries of cultural genocide and return to our original culture. Of course, we can never completely retrieve what was lost in the cultural and physical genocide that we have endured, but we can revive what we know and create a new culture based on the lessons of the past and our collective vision for the future. That includes creating and reviving holidays like Kwanzaa and abandoning western holidays like Thanksgiving and Christmas.